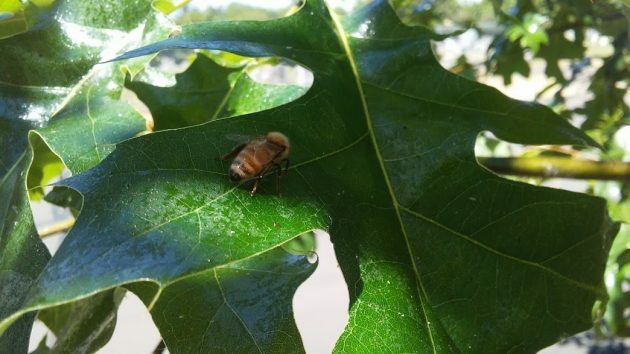 This was something I had not seen before: Bees (including this one) busily sucking up the shiny stuff on the leaves of this young oak on an Albany street. I thought bees were fond of all kinds of blossoms where nectar could be obtained. I had never seen them paying attention to the leaves of deciduous trees before. As luck would have it, we have a very useful Oregon State Extension Service. The service answers questions and puts the answers online. 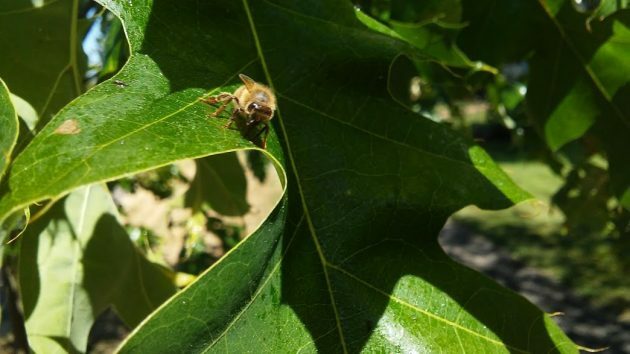 Bees feed on sugars, which usually means nectar from flowers, but they are not shy about consuming aphid waste on the leaves of trees when nectar gets to be in short supply. This sounds plausible to me, because the oak leaves I’m describing are lousy with aphids. These dot-like things are are white and tiny, smaller than the head of a pin. I think what I’m seeing is aphid eggs, actually, if there is such a thing. There also are a few winged creatures, nearly transparent and almost as tiny as the dots, and I’m assuming that they are the next stage of life of these things. Since the aphids exude the liquid waste, I imagine it falls on top of the leaf below the aphid. We see this in our hazelnut orchard as well and wondered why… We have aphids too, thx for the info! the city parks people contracts with pest control co. to spray kill aphids on city trees in the fall. the aphid waste makes a mess on autos under trees.